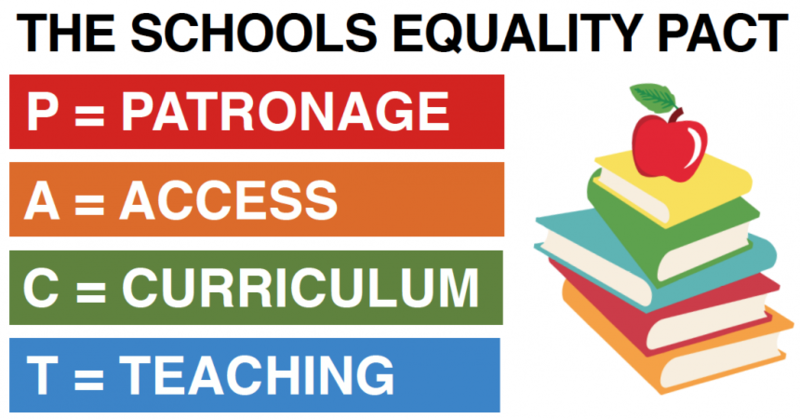 The Schools Equality PACT is a major new initiative of Atheist Ireland to enable everybody, regardless of your religious or nonreligious beliefs, to support religious equality in Irish schools. It is part of an ongoing campaign of national political lobbying, and representations to UN and other international human rights bodies. Irish primary schools are State-funded but privately run, 90% by the Catholic Church and most of the rest by other religions. Religion is integrated throughout the school day. State-funded schools have the legal right to discriminate against children, parents and teachers on the ground of religion. We ask the Irish Parliament to urgently reform the school system of State-funded religious discrimination. This PACT (Patronage, Access, Curriculum, Teaching) describes the changes needed. The State has a duty to respect equally the human rights of all children, parents and teachers. This requires a national network of public secular schools, inclusive of all, neutral between religions and atheism, and focused on the educational needs of all children equally. Divesting some religious schools to new private patrons will not achieve pluralism in education. The Irish Parliament’s Education Committee has warned that multiple patronage and ethos can lead to segregation and inequality. The UN and Council of Europe have warned our schools breach human rights. The State now claims it is constitutionally obliged to allow State-funded schools to discriminate against its own citizens in this way. Others disagree. We ask the Government to respect democracy, and stop closing down debate with an unpublished, untested legal opinion. Finally, if the Courts do find this discrimination obligatory, then we urgently need a Schools Equality Referendum. State-funded schools should have an inclusive public ethos, to respect everyone equally under Articles 42.1 and 42.3.1 of the Constitution. Moral education should be separate from religion, as per Article 42.3.2. The State should not cede control of education to private patrons. Private ethos schools should be an optional extra, not the basis of the system. Please amend the Education Act to do this. Start the reform in the nine schools where the Minister for Education is patron. Children should have equal access to their local State-funded school, whatever their religion. The current Admission to Schools Bill will outlaw some discrimination, but it reinforces discrimination against atheist and minority faith families, calling it ‘lawful oversubscription criteria.’ Please delete Section 7.3(c) of the Equal Status Act to prevent all religious discrimination. If oversubscribed, give priority to children with siblings in the school, then to local children, then use a lottery. Children should be taught the State curriculum, including teaching about religions and beliefs, in an objective, critical and pluralistic manner, as per the European Convention on Human Rights. Faith formation should be outside the school day. Please amend Section 15.2(b) of the Education Act, and the curriculum. Remove Rule 68 of National Schools, that religious instruction is by far the most important subject and a religious spirit must inform and vivify the whole work of the school. Children should be taught by the best teachers, and teachers should have equal access, based on merit, to jobs in State-funded schools. Section 37 of the Employment Equality Act allows schools to discriminate against teachers on the ground of religion. The current Section 37 Amendment Bill will protect Catholic LGBT teachers, but reinforces discrimination against atheist and minority faith teachers. Please amend Section 37 to prevent all religious discrimination against teachers. I d like to help. How can I do this. I am happy as well , my children are not christened and I did not want them to be brainwashed in regards to religion in school. This needs to end. Nobody has the right to force any religion on a child. Great I live in Belfast how can I help ? No place for religion in state schools. Isn’t it strange that in 2018 some countries, such as Ireland and the UK, still don’t find any problem with religion in schools whereas they would consider politics in schools an outrage? It would seem that telling 6-year-old Johnny every day that he strive to be a good Christian is ok, but telling him that he should strive to be a good socialist (communist, republican, democrat etc.) every day isn’t ok.
Go and set up your own atheist schools and don’t be forcing your false beliefs on the majority in this country. Try to practice what you preach and accept that we live in a pluralistic society where people should have the choice to a religious education or not.